Since I've been back from the workshop with Ovanes Berberian, I've been trying out new approaches with each new painting. After being with someone who is such a master and creates such beautiful art, it's easy to be awestruck and want to paint just like that person. After a couple of frustrating attempts going down that path during the workshop, I've taken a new view. Rather than try to paint like someone else does (which ultimately is pretty fruitless and inauthentic), how can I take what I observed and include elements of it in how I paint to enhance that? I'm sure someone said this more eloquently, but the attitude is along the lines of " Don't try to be any one else, just be the best YOU you can be". Right now there are several things I am experimenting with. One is including linseed oil in my paints to give them more fluidity and glossiness. Also, paying even more attention to temperature and making more frequent and deliberate color temperature shifts to add more beauty and interest and also to create more of an illusion of light in the impressionist spirit. Third to include a silver grey on my palette (white plus a touch of Mars Black) to include in mixes to make beautiful neutrals. When making any changes in ingrained habits, like taking on a new health regimen, you can't make too many changes at once. There are only so many new behaviors you can tackle at once. So I've decided to start with exploring integrating these 3 things to see if/how they impact my work. In this painting, I experimented with color. I actually painted it from only a black and white cropped version of a photo of an orange tree I took in California recently. Painting from just the values in my reference material allowed me to have some freedom choosing colors (even though I still stuck to realistic colors here). My aim for this painting was to focus on capturing a sense of light and shadow, which I feel I accomplished. The other thing I was pleased with that up close this painting is pretty abstract- just pieces of different colors, values and shapes (as shown in a detailed close up below) but when you step back it looks pretty realistic. 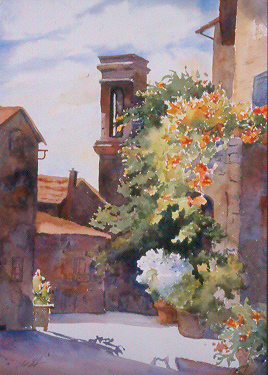 This is one of my favorite watercolors of Tuscany. 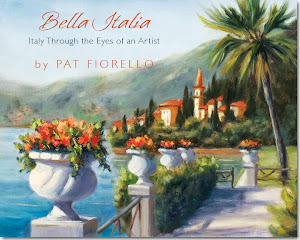 This painting, as well as 14 other of my favorite watercolors and oils are now available as giclee reproductions on Fine Art Marketplace. You can order any size and have them printed on archival paper, canvas or even gallery wrap canvas- whichever you prefer. And shipping is free! Just a reminder, if you'd like to build your skills in painting landscapes in watercolor, I'm teaching a 2 day workshop on the topic at The Art Loft in Dahlonega, GA, Thursday and Friday July 18 & 19 . For more information or to register see: The Art Loft or contact Anita Elder at aelder1@windstream.net. Did another small "warm up" painting to get back into the swing of things after my 3 week hiatus. Trying to pay more attention to varying colors and changing temperatures. May be more evident in the actual painting than in this photo of it. May need to exaggerate even more next time. Well yesterday was my first day painting after a nearly 3 week hiatus from painting while on vacation with my husband in California. It was a wonderful trip, but by the end I was itching to get back to my studio. Especially since I had only had a few days since returning from the workshop studying with Ovanes Berberian before I left again and I was anxious to start exploring and seeing how I might integrate what I learned into my paintings while it was still fresh in my mind. (hopefully small successes before jumping right into a bigger painting). I found a photo from a painting I'd done in a workshop on drawing for painters with Amanda Carter and she gave me permission to use it. I edited it down to just these 3 simple pieces of fruit. My intention for the painting was to focus on color changes, which was one of the things Ovanes stressed. Warm next to cool, cool next to warm. Glad this one helped break the ice to get me back into the rhythm of painting after the longest break I've had in a very long time. Did another small one today and will share that later this week, Now ready to tackle something bigger. This is a second attempt at a painting I started but never finished while at the recent workshop I attended with Ovanes Berberian. There was so much to learn, but I am trying to focus on incorporating one or two new areas at a time. I like the analogy that learning to paint is a lot like learning to juggle. You can get good at juggling 2 or 3 balls, but then when you pick up the 4th, you tend to drop the others. Keep at it and soon you'll be handling all 4 balls, ready to try for a 5th, only to drop them again. I continually have to remind myself it's not a linear process.